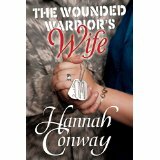 Hannah Conway’s book, The Wounded Warrior’s Wife, is so good! It is a must read and a book you will want to share with every military wife you know. From start to finish, the story captivated me. I was truly sorry when I finished the book because I did not want it to end. In the story of a young Army couple, Hannah weaves the story of Whitleigh and Collier Cromwell. The struggles they face with Collier’s deployments, the birth of their child and the ghosts of Collier’s family past are intense and yet, very down to earth. I loved the realness of the characters and the way that they handled their difficulties. Interwoven in the story is the reality of Christian life and struggling to keep faith when it seems there is nothing to hold on to. I absolutely loved The Wounded Warrior’s Wife and can’t wait for the next book!